Natural spicy pickled vegetables in oil (in conversion to organic farming) without citric acid. Ingredients: chilli, peppers, celery, garlic, salt, extra virgin olive oil. 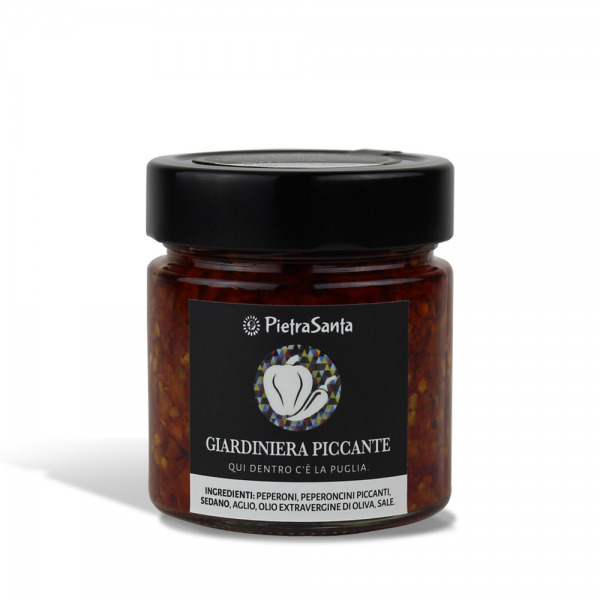 The spicy pickled vegetables are natural traditional preserves from Apulia whose recipe has been handed down from generation to generation: they are chopped chillies and peppers, preserved in our extra virgin olive oil, to be kept ready for side dishes and salads; excellent as a topping for pizza and pasta as well.